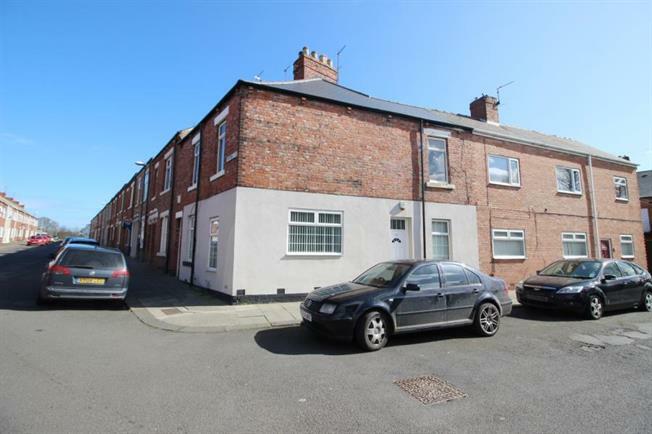 2 Bedroom End of Terrace Flat For Sale in South Shields for Guide Price £50,000. Investors only for this spacious 2 bedroom ground floor flat that is currently achieving 400 per month rent by its current tenant. The property is situated on Whitehall Street and is located within close proximity to local amenities and transport links. In brief the property comprises an entrance hall, lounge, kitchen, two double bedrooms and a bathroom WC. Externally the property offers a shared yard. Please call 0191 4166919 to arrange viewings. Double glazed entrance door with double glazed window to the front. Double glazed windows to the front and side, electric fire and radiator. Fitted wall and base units, work surfaces, stainless steel single drainer sink unit, gas hob, extractor hood, space for washing machine, tiled walls, double glazed window to the side and double glazed door leading to the yard. A double glazed window to the front with a television point and radiator. Double glazed window to the side with radiator and understair built-in storage cupboard. Three piece suite comprising panelled bath, pedestal wash hand basin, low level WC with combination boiler and radiator.